Responsibility.org is a proud sponsor of the groundbreaking CARS screening and assessment tool which was released in June 2017 and is now in use across the nation. You can download CARS at the CARS Training Center. What makes CARS a groundbreaking, first-of-its-kind tool? Fills a need by identifying substance use disorders and an array of mental health issues. Validated for a DUI offender population. Free to download and use on open source software. Contains a self-screener, a screener and a full assessment. Fully electronic and standardized, it can be used by clinicians and non-clinicians alike. Generates a user-friendly report in a matter of seconds indicating the offender’s risk of recidivism and treatment needs. Informs sentencing and treatment decisions. Connects people to treatment facilities in their area based on the assessment outcome. Research tells us that many (45%) of repeat DUI offenders suffer from a mental health disorder in addition to lifetime alcohol disorder. Repeat DUI offenders are highly resistant to change despite previous sanctions, treatment or education efforts. Untreated, undiagnosed mental health issues are likely a major contributing factor to their dangerous, and often deadly, behavior. Historically, screening for mental health disorders among DUI offenders has been rare. CARS was developed to fill this void by providing immediate diagnostic information for up to 20 DSM-4 Axis 1 disorders. Interestingly, using traditional screening and assessment tools, DUI offenders are often incorrectly identified as low risk for repeating their crime which can lead to inadequate sentencing and treatment and repeat DUI behavior. The CARS tool and its innovative approach will lead to more accurate assessments. Screening is the first step in determining whether DUI offenders are at a high risk of recidivism and if they need treatment. The CARS screening tool takes about 15-30 minutes to complete. Offenders who show signs of substance or mental health issues can be referred to the CARS assessment tool which will provide a more in-depth review of offender’s issues and to determine the extent and severity of their issues. Developed by the Division on Addiction, Cambridge Health Alliance, a teaching affiliate of Harvard Medical School, with initial support by the National Institute on Alcohol Abuse and Alcoholism (NIAAA) and ongoing funding from Responsibility.org, CARS is a standardized mental health assessment tool, based on the World Health Organization’s Composite International Diagnostic Interview (or CIDI), that runs on free, open source software. Asks about signs and symptoms of mental health issues both within the past year and lifetime. Identifies specific mental health disorders for which an offender is at-risk. Generates a report that informs the user about a client’s recidivism risk level and treatment needs and provides appropriate ZIP code based referrals. Responsibility.org supports the use of comprehensive assessment for substance use and mental health disorders among the DUI offender population as well as referrals to appropriate treatment interventions tailored to individual risks and needs. CARS has received widespread support from the Governor’s Highway Safety Association, Emergency Medicine Foundation, Cambridge Health Alliance, Harvard Medical School, and Harvard School of Public Health. Continued evidence of co-morbidity in the repeat DUI population, particularly anxiety-related disorders. Full CARS provides diagnostic information. Screening results did not differ significantly by condition, with the exception of conduct disorder among DUI offenders in the self-administered trial setting. 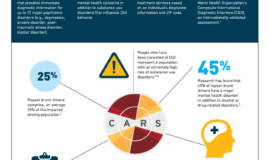 CARS screener does a very good job of identifying substance use disorders. Results from the self-administered screener do not differ fundamentally from those for the interviewer-administered screener. The information collected from the pilots has been instrumental in identifying ways to improve the efficiency of the CARS assessment and will inform the development of online training materials. A report that summarizes the experience of the pilot sites and provides CARS implementation recommendations is now available. 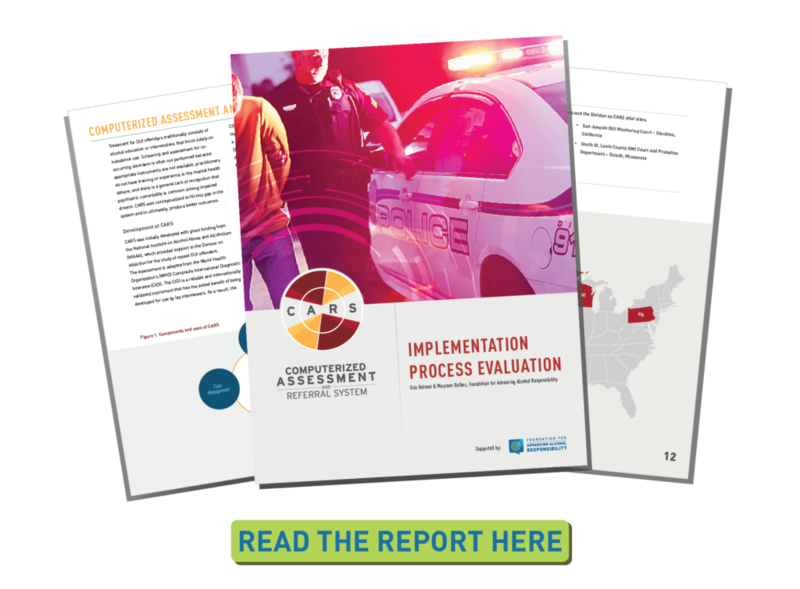 CARS is now available for national distribution; researchers will continue to collect empirical data to link specific mental health profiles to recidivism risk. Currently, CARS identifies DUI risk based on known predictors from the research literature. Expansion of the use of CARS program will enable data to be collected that will allow researchers to modify the risk scale using empirical data to link specific mental health profiles to recidivism risk. Additionally, moving beyond post-conviction DUI programs – time between sentencing and DUI treatment – would represent an earlier assessment and intervention opportunity among at-risk populations. Another exciting development is the piloting of CARS among the general population. This year, Responsibility.org is partnering with the Emergency Medicine Foundation to integrate CARS within two emergency departments. To view or download a webinar that describes the development and implementation of CARS and includes a live demonstration of the software used, please visit this page.